"Linchpin connects employees regardless of time and location"
This is a very important aspect of our vision of Linchpin that we worked on ten months ago in a workshop, which still drives many of our activities today. For me, this aspect is clear in terms of our mission to create Linchpin Mobile. We want to give our employees as well as our customers' employees the ability to collaborate and communicate no matter where they are, or which time zone they're in. When an employee is working while on the road and without a computer, they often become secluded from their colleagues and miss out on important information and conversations. They have more or less no chance to participate or make their voice heard. Now, at any time and from anywhere in the world, employees can access information and connect easily with their colleagues, even temporarily without an internet connection. 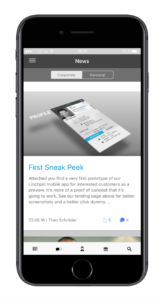 It will take us a few more months to finalize Linchpin Mobile, but we are well on our way. We want to make this vision a reality; but like everyone else, we do encounter obstacles. We are jumping through hoops as quick as we can to solve them. Currently, our new app is closer to realizing our vision today than only a few months ago. And as far as we know, we are the only company in the Atlassian ecosystem that is so close to a complete mobile solution for Confluence (only an app for Confluence Cloud has existed until now). With our Linchpin Mobile app, we can read, comment on, and "like" corporate news articles. We can have discussions together in the microblog and directly find and chat with all of our colleagues. We can see planned events and access content within Confluence's spaces and blogs. There is a growing demand for "mobile-first" solutions. We are still some distance away from achieving that pure goal. But with Linchpin Mobile, it makes sense to implement the main Linchpin desktop applications, because it will connect a large number of employees via Linchpin Mobile who do not normally have desktop access, such as production workers, nurses, branch workers, etc. This is the number one advantage of Linchpin Mobile. It is central to our goal of connecting employees no matter the time or the place. Currently, Linchpin Mobile is in beta. Detailed information about the project and its background can be found in our knowledge base. Are you already a Linchpin customer and want to directly participate in its development? If so, let's talk! By collaborating with us, you can take advantage of significant license discounts, guide product development to cover your needs, and much more.